Spanish scholar and Hebrew poet of the thirteenth century; born, as some believe, at Guadalajara in 1244. Geiger, in "Melo Chofnajim," German part,p. 62, gives the name as Segullah. According to Abraham Zacuto ("Yuḥasin," ed. Filipowshi, p. 222), Sahulah died in 1268; but the latter, in the preface to his "Meshal ha-Ḳadmoni," clearly indicates that he began to write that work in 1281. He states, moreover, that from his childhood he had had a predilection for poetry and fables, but that on attaining manhood he had occupied himself exclusively with profane poetry. It was only at the age of thirty-seven that he changed his mind and composed his "Meshal ha-Ḳadmoni" (Soncino, 1480), a collection of allegories or fables in rimed prose. In his preface, which also is written in rimed prose interspersed with verse, he states that his material was original, but that in style he imitated the Prophets, in order to present moral subjects in a concrete form. His chief aim was to show that the Hebrew language was as suitable for allegories as the Arabic, and yet he imitated the Arabic style. The work is divided into five parts ("she'arim"), each of which is subdivided into two chapters ("sedarim"). The first part contains a treatise on the intellect; the second, on penitence; the third, on correct advice; the fourth, on humility; and the fifth, on the fear of God. The fables often overlap one another; and sometimes the author puts into the mouths of animals utterances not usually met with in the domain of fable. The fables and narratives give evidences of the cabalistic tendencies of the time, so much so, indeed, that Moses ben Shem-Ṭob de Leon read this work carefully and, being greatly pleased with it, actually claimed its authorship for himself in his "Mishkan ha-'Edut" (comp. 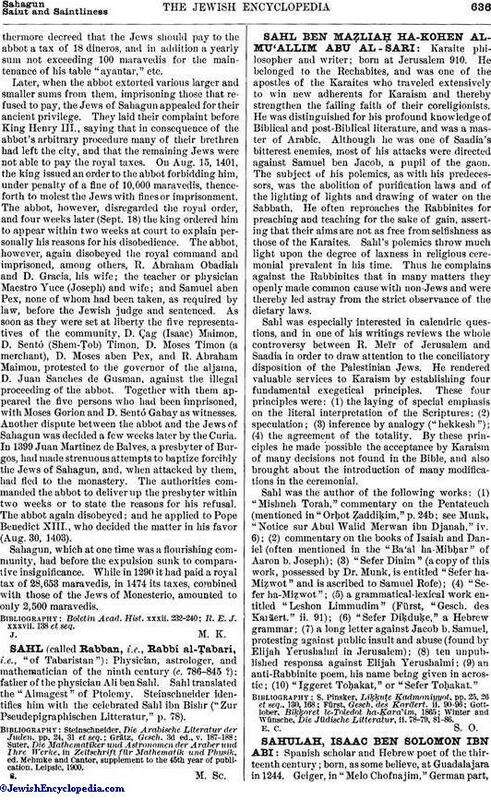 Jellinek, "Moses b. Schem Tob de Leon," p. 43, Leipsic, 1851). The work was translated into Judæo-German by Gershon Wiener (Frankfort-on-the-Oder, 1749). Sahulah wrote also a commentary on Canticles and Job, which is still unpublished. Henry Mauroy ("Apologia pro Judæis Christianis," i. 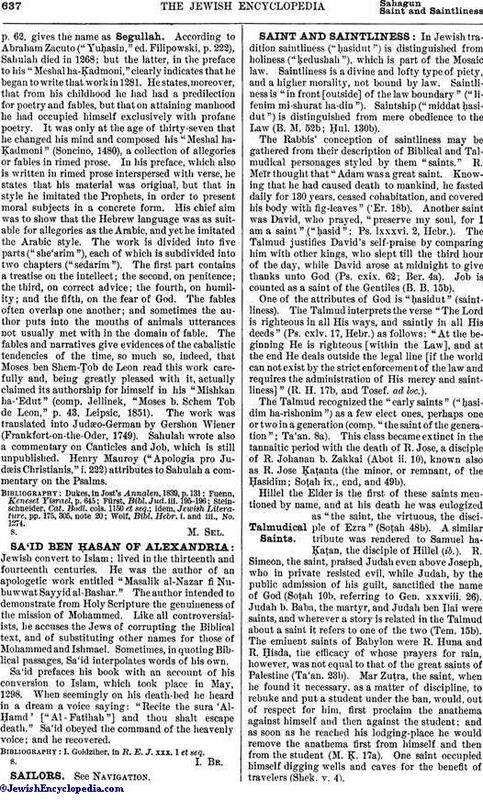 222) attributes to Sahulah a commentary on the Psalms. Wolf, Bibl. Hebr. i. and iii., No. 1274.